Mozilla’s Firefox 4 got off to a strong start, with more than 100 million copies of the browser downloaded in its first month of availability. However, that was before Mozilla turned on Firefox Update late last week, which reaches out to eligible users of previous versions of Firefox and asks them if they would like to upgrade to Firefox 4. Since then, according to Mozilla’s community coordinator for Firefox marketing Asa Dotzler, the proportion of users running Firefox 4 has jumped nearly 30 percent. Strong words, but Dotzler does have some figures to back them up. 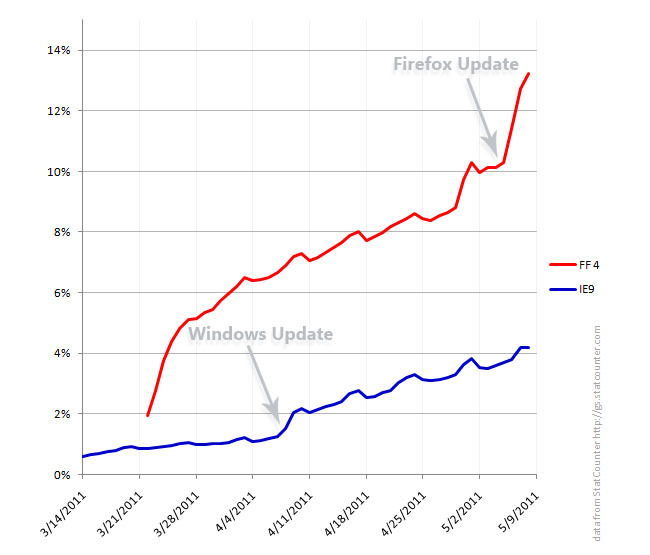 According to StatCounter, Firefox 4 along accounted for 13.2 percent of all browsers, a 30 percent increase from the 10.3 percent Firefox 4 had captured prior to Mozilla enabling Firefox update. In comparison, Internet Explorer 9 now accounts for just over 4 percent of the global browser market, although it also saw a jump in usership when Microsoft enabled IE9 updated via Windows Update in early April. Microsoft says most Windows Vista and Windows 7 users will have received an offer to upgrade to IE9 by the end of June; Internet Explorer 9 does not support Windows XP. Firefox 4, conversely, supports Windows XP, Vista, and Windows 7, along with Mac OS X 10.5+ (Intel only) and Linux. However, both Internet Explorer and Firefox have been struggling to grow their overall marketshare in the wake of their recent releases: although there have been some variations, neither browser has managed to staunch gradual slides in overall share of the Web browser market. In the meantime, Google’s Chrome is the only browser showing strong growth in overall share.